Auntie Aud is going to tell you ghost stories today so go take a pee and sit down. You’ve heard of taxi drivers who drive around late at night and encounter all sorts of spooky stuff right? The other day I talked to someone who used to work as a taxi driver. Let’s call him Sekar. This is a true story I assure you! I was as spooked out as you when I heard it. Some more I heard it at night. You’re not reading this at night too are you?! Anyway when Sekar was a cab driver, he had a few regular customers whom he’d drive up to Genting Highlands on the weekends to hit the tables. They were so regular that they had his number and everything. They would call him up whenever they wanted to go up at night, and off they’d go. But Sekar didn’t think about that. All he thought was “wah even coming down also got customer” and stopped his taxi for the girl to get in. The girl was very quiet the whole time, didn’t say a word also. Sekar just kept driving. As you know, the road from Genting is winding so Sekar looked into his rear view mirror. There was nobody in the backseat. Shocked, he quickly turned around to check. The girl wasn’t in the backseat. But she was sitting on the boot of the car, OUTSIDE the car, looking at him. Sekar was so scared he crashed his car wtf. So scary right!!!! If that happened to me I’d be chanting Sanskrit right now and sleeping with my lights on. But as you know, everything is a joke to me wtf. So I got to thinking: what if one of the factors in the story was changed? How would it have turned out? To help you along in your imagination a bit, I helpfully recreated a video of the story for you. Helpfully assisted by Fat Her and Mummy Ooi HAHAHAHA. When making it I was so scared it’d turn out lame -_- But it was quite fun doing it with my parents hahaha I love them for being so sporting about it even though we were shooting at 12 midnight any Mummy Ooi was so scared a real ghost would show up WTF. Actually when I was searching for the music for the video I scared myself too wtf. Some behind the scene photos.. Taxi Driver Fat Her. Note the eyeliner mustache HAHAHA. And the two pairs of spectacles he’s actually wearing HAHAHAHAHA. 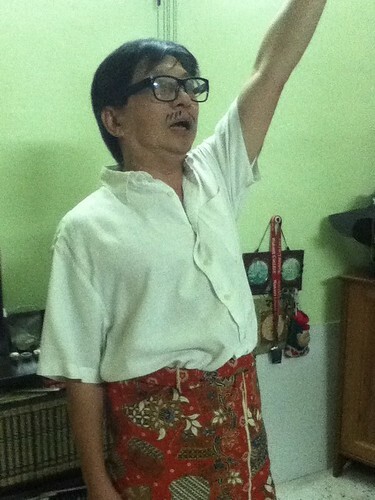 Put him in this getup then realized Fat Her suddenly resembled Tunku Abdul Rahman HAHAHAHAHA (our first prime minister). So we added on a sarong to make it more authentic. Too bad no songkok only. 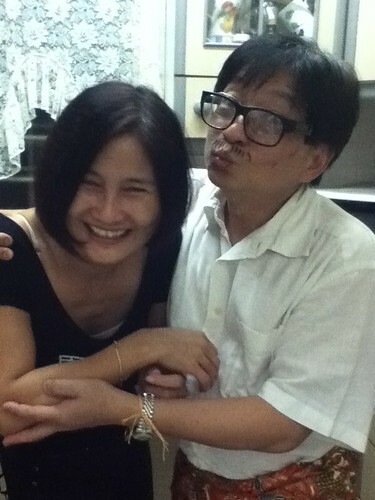 Mummy Ooi wasn’t too keen on getting kissed by TAR / Chua Jui Meng wtf. P/S: if you couldn’t tell this was actually another idea for a similar themed video I did recently 😛 I decided to submit the other video for the contest but thought since I had this ghost video also might as well put it up. all i could think of is how brave you were aud to stand there in complete darkness until your dad’s car reached you and picked you up on the road!!!! weren’t you scared being there all alone in the darkness without any lights!?!?!?! i’d pee my pants if i were you!!!!! O____o!!! hahahha u diedie wanna post this up ! lol.. awww.. such cutesie and sporting parents!! nabehhh quite scary right the way you look? Also, the concept of you reappearing outside the car (as opposed to disappearing completely) quite spine tingling also. your parents are so cute! n when you get to krabi, u MUST go to railay! dont just stay in krabi town or aonang. Railay is sooo much more beautiful 🙂 enjoy ur trip! HAHAHAHAHAHAHAHHAHAHAHAHHA didn’t expect that hilarious twist in the tale LOL. your parent are awesome, by the way. That was awesome! Your parents are so sporting. Joanna, hhahahaha seriously !! i swear that driver is scared for life !!!!!! OH this really reminds me of a story my dad told me about his long-time friend. So his friend and his wife were in the car driving dunnowhere (but I remember it was a long road in some kampung or something), and his wife was the one driving. Then after a while, they passed a pretty woman in white – and the husband told my dad how weird it was because no one really goes on that road. Especially also because it was around 2am or 3am, middle of night and stuff. Then the wife asked her husband ‘tengok tak..?’ and he replied yes and said it was very eerie, and told her to just keep driving. 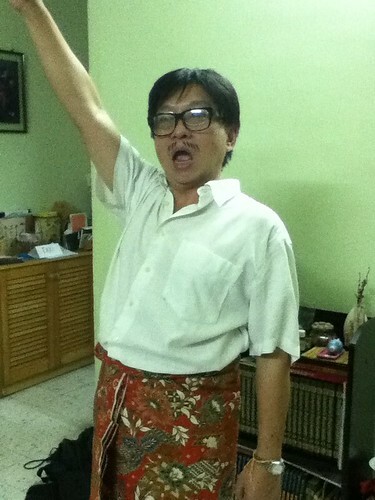 why nobody comment on fat her’s tunku Abdul Rahman impression wan!! Hahaha I thought it’s damn funny ok! i was just abt to comment!! ure dad is so cute let u draw on his face! wtf!! LOLOLOLOL!!! so funny!!! Hahahahahahahaha. Your dad did a great job too! LOL! double thumbs up for this video and both of your parents !!! hahahha ur parents are awesome! hahaha rofl.. bet the car driving the opposite direction when your dad picked you up had freaked out! OMG fourfeetnine, I really thought you were a ghost. My boyf and I were driving home one night, we saw this little girl in all-white pyjama, long-hair, standing still at the side of the road, wth!! I did not manage to catch a glimpse of her looks. I did not even dare look at the side mirror to see if she’s still there (in case she’s not). But, we saw a Myvi on the opposite road(in which now I know it is Fat Her, LOL), stopped and my boyf saw (from rear view mirror) her hopped in.